INWEST Distance Measuring | Advanced Machine & Engineering Co.
INWEST is an electronic distance measurement system which monitors the position of the tool. The system combines analogue sensor electronics with a limit switch and, thanks to its compact design, can be integrated into our unclamping units. The distance measurement system comprises an inductive sensor in the unclamping unit, a target ring on the drawbar shaft and sensor electronics. INWEST detects the position of the drawbar shaft and makes it possible to identify the three clamping statuses ‘Unclamped’, ‘Tool clamped’ and ‘Clamped without tool’. The signal sent to the machine control system can either be analogue (4–20 mA or 2–10 V) or digital (S1, S2, S3), and it can be sent either during rotation or when the system is idle. The analogue measurements are analysed by the machine control system or the built-in position controller. An external position controller can be connected in order that measurements can easily be viewed on the display. A USB interface, the OTT-JAKOB software and a Windows PC are required to program the digital outputs. 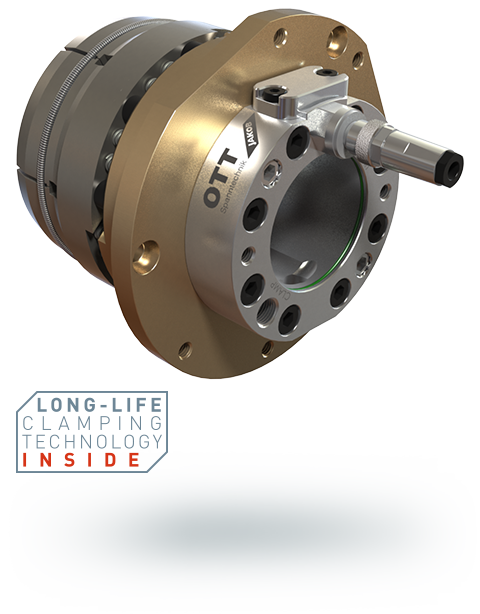 Tool tolerances required for programming purposes can be ‘taught’ with Power-Check 2 from OTT-JAKOB.